French organ music from the period of Louis XIV to the Revolution has always held fascination for performers and listeners alike. The kaleidoscope of colours, the rich and varied styles, and the sheer exuberance of the music never fail to captivate. Yet, performance practice of this music has never been fully understood. David Ponsford has spent much of his career studying this repertoire, resulting in his book ‘French Organ Music in the Reign of Louis XIV’ (Cambridge University Press, 2011). The present series of recordings on the most important historical organs in France, including the music of Guillaume-Gabriel Nivers, Louis Couperin, Nicolas-Antoine Lebégue, André Raison, Jacques Boyvin, François Couperin, Nicolas de Grigny, Louis Marchand, Louis-Nicolas Clérambault, up to composers of the Revolution such as Balbastre, Beauvarlet Charpentier and Lasceux, is therefore the fruit of many years of research by a seasoned performer whose aim is to combine technical brilliance with intellectual understanding, to bring the music alive with authority and meaning. ‘Actively engaged in Organ and Harpsichord Recitals, Recordings, Publications, Lectures and Master-Classes, Conducting and Continuo Playing’. "This is a treasure trove of music, performed on an instrument which Boyvin must have played . . . David Ponsford elegantly dances his way through minuet and bourrée, and the crystal-clear sound of the organ, with its low pitch and Sauveur temperament, makes for a hugely enjoyable addition to the series." 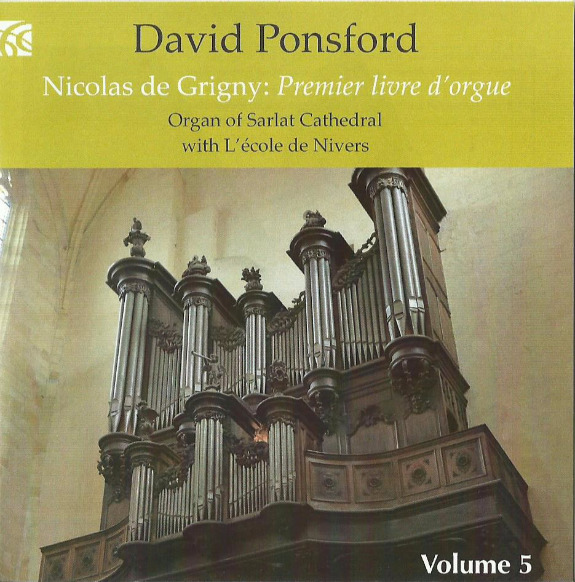 Without doubt, Nicolas de Grigny (1672-1703) was the greatest of all the organist- composers from the period of Louis XIV. He was unique in combining expressive detail with a command of large-scale structure, and his music, written for the large organ in Rheims Cathedral, has an integrity and a stature that eclipses all his French contemporaries, recognised by the manuscript copies made by J. G. Walther and J. S. Bach. The large 1752 organ in Sarlat Cathedral was a wonderful instrument on which to record de Grigny, with the organ’s tonal colours, sheer brilliance and power being enhanced by the Cathedral’s reverberation time of eight seconds. "Nicolas de Grigny’s Premier livre d’orgue (1699) contains the Mass and the hymns for the principal feasts of the church year. This double CD is a must-have-and it’s a whopper; the erudite liner notes are worth having in their own right. All too often the repertoire is left high and dry, without the supporting plainsong: L’école de Nivers provides the chant in a broad-based tempo, and it is refreshing to hear the inclusion of the serpent (played by Philip Humphries). The 1752 Lépine organ clings limpet-like to the west wall of Sarlat Cathedral in the haut−Dordogne and is a forgotten gem; it is well off the beaten track, and it is good to hear it recorded once again. Its ten-stop Positif, sixteen-stop (16’) Grand Orgue, two-stop Récit, Écho (a Cornet) and eight-stop Pédale (with thunderous ravalement) are resources that David Ponsford relishes, and he doesn’t hold back." This CD of Nivers and Lebégue was recorded on the famous organ in Auch Cathedral built by Jean de Joyeuse in 1694, and restored by Jean-François Muno in 1998. The instrument is one of the largest historic organs in France, with 42 stops, four manuals, modified meantone temperament and a wonderful ‘Rossignol’ stop. The Jean Boizard organ in Abbey of Saint-Michel-en-Thiérache dates from 1714, containing 90% original pipework, and its survival through fires, revolutions and two world wars is a miracle. The organ is exactly contemporary with the Suites du premier and du deuxième tons by Clérambault. Also recorded is the Messe du premier ton (1688) by André Raison, who was Clérambault's teacher. Volume 2 of the series was also recorded at La Flèche, with all the vibrant sonorities that bring this music to life. François Couperin's Messe pour les paroisses (1690) is accompanied by David Ponsford's transcription of Charpentier's Messe pour plusieurs instruments au lieu des orgues (1674), a work which, Ponsford is convinced, began life as an organ mass (now lost) and was then orchestrated to fulfil the musical requirements of a major religious festival at Notre Dame de la Mercy in Paris, when the purchase of an organ was withheld for legal reasons. Volume 1 of the French Organ Music of the Golden Age series was recorded on the historic Lavasseur/Dangeville organ in the Prytanée National Militaire, La Flèche. Restored to its 17th to 18th-century specification by Jean-Pierre Conan, half of its 35 stops are original. This CD contains François Couperin's Messe pour les couvents (1690) and Pierre Du Mage's 1er Livre d'orgue contenant une suite de premier ton (1708). The 450th anniversary of the birth of John Dowland (1563-1626) was the catalyst for this new recording of his exquisite songs, together with songs and keyboard music by his contemporaries. Since acquiring a beautiful muselar virginals, David Ponsford realised at once its perfect suitability for accompanying lute songs. This recording is therefore an experiment in the use of virginals and organ to accompany this programme of Dowland, Campion, Byrd, Gibbons and Tomkins, in which Simon Ponsford makes his debut solo recording. Organ music with French influence by J S Bach (Fantasias in G major and C minor, Passacaglia in C minor, An Wasserflüssen Babylon) together with their supposed French models by François Couperin (Tierce en taille and Offertoire sur les Grands Jeux from Messe pour les couvents), André Raison ( Le Vive le Roy des Parisiens , Trio en passacaille ), and Nicolas de Grigny (the complete Gloria in excelsis from Premier livre d’orgue ). Played on the Peter Collins organ (1990) at Greyfriars Kirk, Edinburgh. “This is a splendid disc which shows off the many colours of the Peter Collins organ and its versatility in conveying the essential tone character both of French and German organ traditions.” Nicholas Anderson, Classic FM Magazine “David Ponsford’s programme is exciting.” Adrian Jack, BBC Music Magazine. “This CD admirably highlights the close relationship between French music and Bach’s compositions. Ponsford has contributed an informative and scholarly booklet. I hope this disc won’t be confined to university music departments or conservatoire organ students, as it deserves to be heard by a wider audience. Ponsford’s Bach performances have a natural simplicity of approach that is as enjoyable as the flamboyance of a Koopman. The simple registration of the C minor Fantasia is very effective; the gently varied colours of the Passacaglia work beautifully, and this piece receives a fine interpretation with some telling rubato. The French works are given dignified performances, appropriate to their sacred ethos, and there’s some stylish ornamentation.” Christopher Nickol, Gramophone. J S Bach’s first publication of music for organ - Clavierübung Part 3 (Leipzig, 1739) - is a monumental collection of chorale preludes appropriate to the Lutheran liturgy. Framed by the massive Prelude and Fugue in E flat major (BWV 552), the cycle is suffused with religious, pictorial and numerical symbolism. Coupled with the most beautiful of Bach’s chorale partitas, Sei gegrüsset, Jesu gütig, it is recorded on one of Great Britain’s largest new mechanical-action organs - the Peter Collins organ Greyfriars Kirk, Edinburgh. “The scholarly David Ponsford turns out a pretty impeccable performance . . . he also includes the monumental Partita BWV 768 and gives a fine interpretation of this glorious work. Guild’s recording is crisp and very immediate with fine detailed notes. I await further organ CD's from this source with interest.” Gerald Fenech, Classical Net Review. Harpsichord music celebrating the birth of J S Bach (Partita No. 4 in D major), Handel (Suite No. 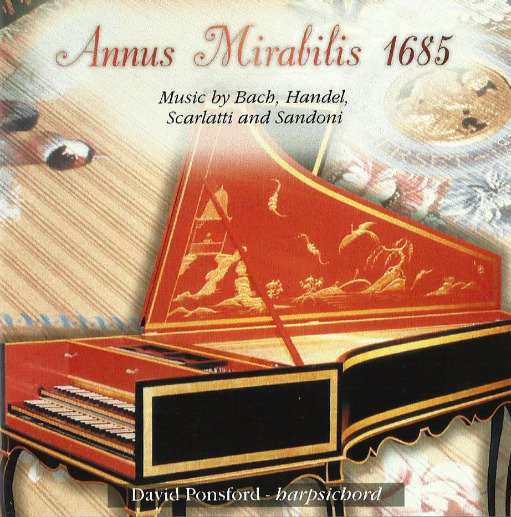 7 in G minor), Domenico Scarlatti (Three Sonatas from Essercizi per gravicembalo ), and first recorded performances of two pieces by P. G. Sandoni (1685- 1748) transcribed and edited by David Ponsford. “Ponsford’s playing is subtle and stylish - exquisitely liquid in the more lyrical movements . . .” Kate Bolton, BBC Music Magazine. Parthenia was the first keyboard music to be printed in England, and was a wedding gift to Princess Elizabeth Stuart, only daughter of James I and VI, and Frederick V, Elector Palatine of Heidelberg. It contained music by the three most famous composers of the age, William Byrd, Orlando Gibbons and John Bull, and is here recorded on three very different instruments: harpsichord (by Andrew Garlick) and muselar (by Malcolm Greenhalgh) in the style of Ruckers, and an Italian harpsichord by Colin Booth. A scholarly essay by Janet Pollack is included in the booklet. “David Ponsford is a sensitive and imaginative player, and brings a sober and poignant sensibility to the pavans that I think is just right. His sense of phrasing and articulation is very good too, aided in no small measure by his extensive reliance on historical fingerings . . . The pitch is A=392 and the meantone temperament is wonderful. The sound quality is very natural – not overproduced – which allows me to enjoy the timbre of these fine instruments almost as if I were playing them myself.” Robert Haskins, Harpsichord & fortepiano. A new recording of the 1786 Samuel Green organ in its new home and tuned in Vallotti temperament. The selection of music reflects the repertory that would have been played on such an instrument in the late eighteenth century: Handel, Stanley, JS Bach (preludes and fugues from the Well-tempered Clavier ), Scarlatti, Croft, Walond and Arne. ‘This well-recorded disc serves to remind us of the excellence of David Ponsford’s playing. Each and every piece is given a stylish performance.’ Roger Fisher, Organists’ Review. This is the first recording of one of Great Britain’s most interesting chamber organs. The nameboard is inscribed ‘ This Organ, was Originally built by that celebrated Artist, commonly called, Father Smith; and was erected in its present form, by Robert Gray; of London, 1775 .’ All but a few pipes do indeed date from the 1670s, and three different repertories are played. Jacobean: Byrd, Gibbons, Tomkins Restoration: Froberger, Blow, Purcell Georgian: Handel, Battishill, Walond, James, Stanley. This is the first in a series of three CDs devoted to the complete violin sonatas of J S Bach, together with sonatas by his son C P E Bach. From the monumental set of six sonatas for violin and obbligato harpsichord, the Sonatas No. 3 in E major (BWV 1016), No. 4 in C minor (BWV 1017) and No. 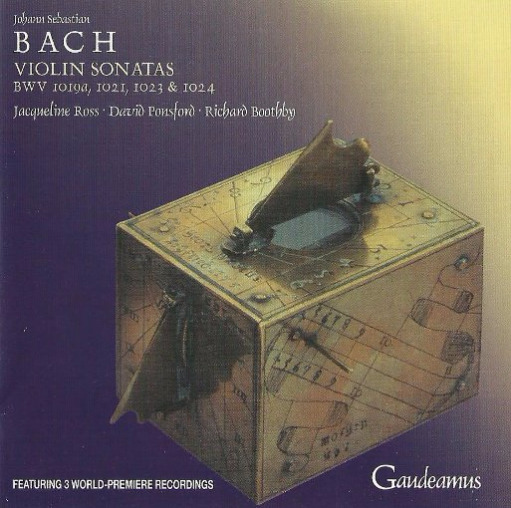 2 in A major (BWV 1015) form the core of this first CD in which David plays with the American violinist Jacqueline Ross, who plays on a 1570 Andrea Amati violin. Also included are the Sonatas in F major (BWV 1022) and G minor (BWV 1020), attributed to both J S and C P E Bach. “played with inflective grace and linear clarity... There is a directness about their playing, which reaches the heart of the music with less effort and baggage than some rival versions. This pays off especially well in the three great sonatas, whose performance contains more allure than those by Sigiswald Kuijken (BMG) or Andrew Manze (Harmonia Mundi)." Nicholas Anderson, BBC Music Magazine. J S Bach’s obbligato sonatas No. 1 in B minor (BWV 1014), No. 5 in F minor (BWV 1016) and No. 6 in G major (BWV 1019) are juxtaposed with two previously unrecorded sonatas by C P E Bach: Sonatas in C (1745) and D (1731). Catalogue No. CD GAU 308. “Jacqueline Ross, playing a beautifully even-toned Andrea Amati violin of 1570... demonstrates a wide range of expressive means, embellishes tastefully and uses vibrato, as well as messe di voce and other nuances, effectively and economically... the overall impression is of committed, stylish performances that bring new insights into this repertory... David Ponsford’s harpsichord contribution is excellent.” Robin Stowell, The Strad “Wonderful playing... recommended” Early Music Review. J. S. Bach’s obbligato sonata No. 6 in G major in its early version (BWV 1019a), continuo sonatas in G major (BWV 1021), C minor (BWV 1024) and E minor (BWV 1023), and two sonatas by C. P. E. Bach in B flat major and D major. Features 3 world-premier recordings. “The inflective grace and linear clarity achieved by Ross and Ponsford, above all in their playing of the sonatas with fully written out harpsichord accompaniment, are qualities of their musical partnership which I have admired in the preceding volumes. Ross and Ponsford play with stylistic assurance and an expressive warmth which touches my heart in much the way as composers who cultivated the Empfindsamer Stil intended. A fine achievement all round.” Nicholas Anderson, International Record Review. Alan Davis uses Handel’s own manuscript of these incomparably beautiful sonatas, and plays on a recorder by Frederick Morgan after Stanesby (c. 1720). Handel’s solo harpsichord suite in G minor completes the programme, which is supplemented by authoritative essays by the performers. “Davis and Ponsford balance expression and cleanness as well as anyone I have heard, and it is hard to imagine a better performance of these sonatas any time soon. Well done.” Kreitner, American Guide. “It’s just that cantabile quality Alan Davis and David Ponsford bring to these beautiful new recordings . . . This, and the relative sparseness of using harpsichord accompaniment alone (and here Ponsford is as eloquent a partner as he is a soloist in the Harpsichord Suite No. 7 which ends the disc), result in deeply moving performances (perfectly captured by Paul Arden-Taylor) that gets to the heart of the matter with little fuss.” Robert Levett, International Record Review.